(AINA) -- Hundreds of Copts rallied on Sunday evening against the torching of St. Georges church in Sarsena on Friday (AINA 2-16-2013), as well as the escalation of destruction of churches by Muslims. 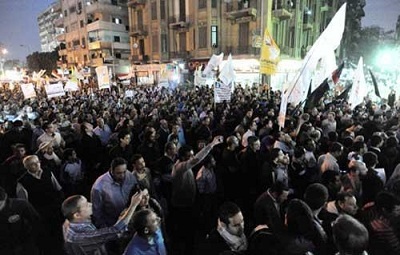 Several Coptic rights groups organized a march from Shubra, a densely populated area in Cairo, to the High Court building in downtown Cairo, to "demand justice" as the organizers said. 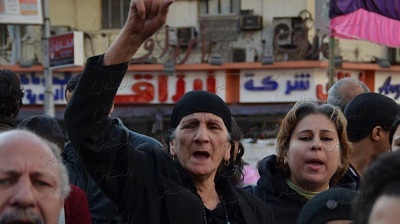 Demonstrators demanded the Sarsena church be rebuilt and the perpetrators be prosecuted, in addition to the assailants of previous attacks on the churches during the last two years since the ousting of Mubarak. They also demanded an end to the customary "reconciliation" meetings forced on Copts by the authorities, in which Copts lose all their rights. "We are going down to the streets for the church torched in Fayoum," said Yvonne Mosad, PR of Maspero Coptic Youth Union, "and against the customary reconciliation meetings held every time something takes place against the Copts. We want the application of the law." 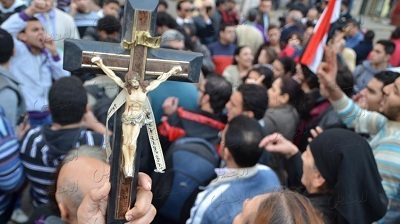 The Coptic demonstrators included a large number of children accompanying their parents. A large number of liberal Muslims joined the demonstration. 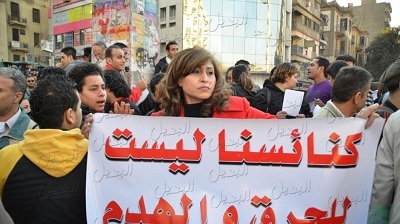 The marchers chanted "Maspero, Maspero," calling for the completion of their march to the State radio and TV building in Maspero, the site of the massacre that killed 24 Copts and injured over 300 (AINA 10-10-2011). According to officials, the attack on St. George's Church was triggered by a Muslim family living next to the church, who complained about the sound coming from the church during mass on Fridays and Sundays. The Muslim family has been living next to the church for 15 years and had not complained previously. During the attack on Friday, Muslims voiced the real issue, which was the church is "an unlawful neighbor to the Muslims who live adjacent to it and must therefore be moved." The Tamiya security chief said in an interview on Al-Hayat independent Egyptian channel that the torching was not of a church but a small room annexed to the Coptic community center and the church wanted to build it without a license. He also said that what was torched was a single wooden chair. But the church said it is not a community center but a proper church. Authorities placed a security guard at the gate of the church. The guard prevented the media from filming the church and prevented journalist and local parishioners from entering the church. A customary "reconciliation" meeting was held on Saturday evening, which many found to be unfair and humiliating, like all such previous meetings forced by authorities. The meeting was attended by seven Copts without the presence of the clergy, four of whom were chosen by the Muslims, the Muslim neighbor family that complained, four Muslim arbitrators and the heads of the security and Chief of Detectives in Tamiya. The church was attacked once again by Muslims While the meeting was in progress. Molotov Cocktails and stones were hurled at the church while Muslims shouted "We do not want the church." Some Muslims climbed up the church to completely destroy the remains of the wooden dome. One of the Coptic delegation to the "reconciliation" meeting, Mr. Gameel Abraham, left in protest of the unfairness of the terms of "reconciliation" set for the Copts. He noted that the losses suffered by the church were destruction in parts of the dome and the windows, as well as seats which were torched, icons, images and saints' relics. At the meeting the neighboring Muslim family wanted to classify the church as a community center but the Copts rejected this. Police records classify the building as a church. Among the conditions in the agreement imposed on the church, which the Coptic delegation was forced to sign, is that it is not allowed to restore the church to its original height before the attack, but it should remain the new height after the attack, not exceeding 3 meters. The church was compelled to agree to build a 17 meter long, 30 centimeter thick wall from inside the church area, filled with soundproof material, and to build another wall, 5 centimeters thick, between the church and the Muslim neighbor, also filled with sound proof material, to absorb the sound of hymns emanating from the church. In Addition, it was decided that the roof of the church be covered with soundproof material as well as the tiling of the roof of the Muslim neighbor, at the expense of the church, to further diminish the "noise" coming out of church during its semi-weekly mass. The church was forced to agree not to use the spare area outside to increase the size of the church and not to use it as a kindergarten, but to use it as a store room. There was no mention of who will be responsible for paying for the losses of the church and whether the dome and the Holy Cross on top of the dome that were destroyed by the Muslim mob will be replaced. No one responsible for the church assault has been arrested.